The Indoor Football League (IFL) has named RB LaRon Council, DL Quince Holman and KR Korey Williams Vidswap.com Week 16 Players of the Week. Green Bay RB LaRon Council has been named Vidswap.com’s Offensive Player of the Week. Bloomington DL Quince Holman and Sioux Falls KR Korey Williams have been named Vidswap.com’s Defensive Player of the Week and Special Teams Player of the Week, respectively. IFL Offensive Player of the Week: Green Bay RB LaRon Council (5’10, 205, Northwest Missouri St.) rushed for five touchdowns and helped the Blizzard score a franchise record 89 points in an 89-27 victory over the Reading Express. Council rushed 15 times for 77 yards and five touchdowns. It is the second five rushing touchdown performance in the IFL this season. Council can set IFL history this week vs. the Wichita Wild. 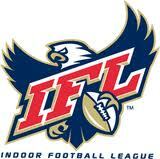 Council needs 45 rushing yards to set the IFL record for rushing yards in a season. He is also 108 yards away from rushing for 1,000 yards, an extreme rarity in the indoor game. This is Council’s second Offensive Player of the Week Honor. He previously won in Week 10. IFL Defensive Player of the Week: Bloomington’s Quince Holman (6’4, 270, Northern Illinois) had a dominant performance in the Edge’s 74-64 victory over the Cedar Rapids Titans. Holman sacked Titans’ QB Colton Hansen 3.5 times, which is the highest single game sack total in the IFL this season. Holman also added 12 total tackles and also blocked a Field Goal. Holman is the third different Bloomington player to win Defensive Player of the Week. IFL Special Teams Player of the Week:On a day where the Sioux Falls Storm tied the best record in IFL history, KR Korey Williams (5’11, 185, Northwestern Oklahoma St.) put in his most explosive kick return day of the season. Williams returned two Colorado kickoffs for touchdowns in the Storm’s 69-26 victory over the Ice. In total, Williams returned five kickoffs for 165 yards for a 33 yard per kick return average. Williams also added seven rushes for 18 yards and another TD as well as one catch for 16 yards. Williams finished the game with 199 All-Purpose yards. Vidswap.com is a web-based video editing and analysis application for sports organizations, specializing in game exchange, video sharing and game analysis. We serve HS, amateur, college, youth and pro teams.